The project Schmuck Wander is an international event initiated by Slovak artists from the field of artistic jewellery in 2009. It was first presented in Bratislava, later in Vienna, Munich, Berlin and lately during the cultural event Vivart! Festival in Budapest. 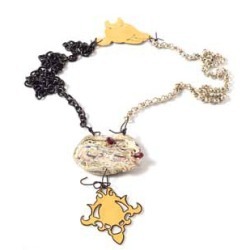 The exhibit promotes not only the exhibited artefacts and their authors, but also the idea of cooperation of artists through artistic jewellery. Its main goal was to establish new contacts, strengthen communication and most of all collaboratively create new artefacts. The outcome of the project Schmuck Wander is the presentation of artists working in the area of artistic jewellery in Slovakia and abroad. Schmuck Wander presents the cooperation of artists and their common creative work on one object – a piece of jewellery. Each participant was free to choose the next artist and could also freely choose the mode of their creative intervention. The individual journey of 15 pieces of jewellery that were “sent to the world” is documented in a journal recording their rout and the concept of creative interventions. This year the 3rd of the event took place that will become a part of this exceptional travelling exhibition. In contrast to the previous years, its concept was modified and both established and beginning artists started with small silver from the most famous Slovak jewellery artist Anton Cepka. This year of the event, together with the previous two, will be presented also in other European cities – first again in Bratislava in September during the event Design Week 2013 and then in Amsterdam where it will be part of the jewellery fair Sieraad Art Fair (November 2013).